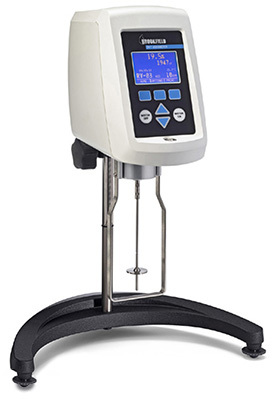 The head of the DV-1M viscometer features a new shape and a larger easy-to-read display. Multiple language choices are now included and the user interface has three hot keys for quick access to spindle selection, test speed and other functions. The operator can now customize the display, choosing which number appears larger on screen based on their operational preferences. And, the DV-1M now features the same lab stand found on Brookfield's DV3T Rheometer and DV2T Viscometer, providing plenty of room for sample placement. Optional Wingather SQ Software allows the user to collect, analyze and record test data. Multiple tests can be compared graphically and the user can export data files to Excel. The new DV-1M Viscometer includes a USB output connection for a Dymo Printer. The DV-1M features direct access to time measurement functions (time to torque, time to stop). This instrument can be ordered with the temperature measurement option. Optional RTD Temperature Probe - Must be ordered when instrument is first purchased.